PCSchool has recently enhanced the functionality of “Online Subject Selection.” Schools are now able to restrict a selection to a “TagSet.” To do this, when setting up the selection, opt to use a “Student Tagged Set” instead of choosing a Year Level. Please note that this is a change in the way that a TagSet used to work. Previously it did not exclude users not in the TagSet from accessing the selection set, it does now. After creating the “Tagged Set,” based on your criteria, you have the option to either “Return ALL in grid” or “Return Tagged Only.” Depending on which option you choose, the students allowed to select from this set of settings will be made. To restrict the students able to make this selection to the members of the “Tag Set,” you must now save the changes. If you wish to add or remove students who are eligible to make this selection, press the [Show] button in the TagSet area. Make the necessary changes and return using the appropriate option. Ensure you re-save the changes by pressing [Save the Current Changes]. If a student attempts to use a link that they are not a member of the tagged set, they will be shown a message indicating that this is a “View Only” option for them (it is possible a student removed from a TagSet may still have a link to it). If you need to re-email a link to a sub-set of students, it is IMPORTANT to save the original TagSet first. 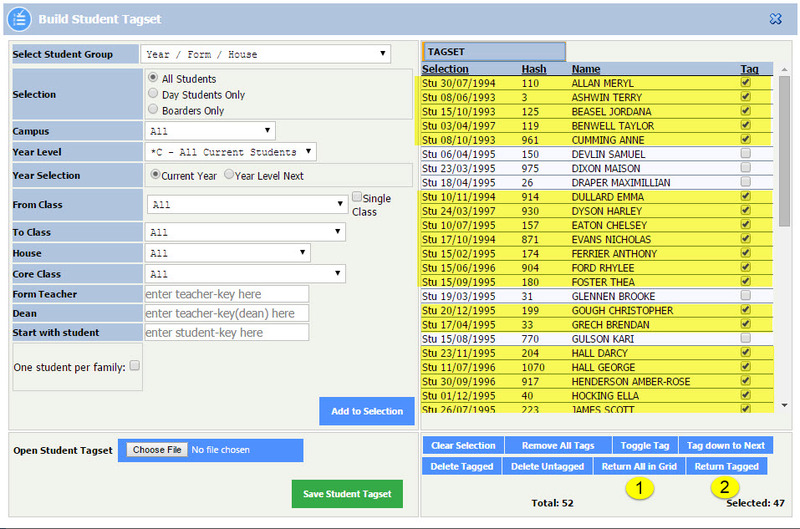 After saving the TagSet, select the students you need to re-email, then press [Return Tagged]. When sending the email, this sub-set of students is automatically saved so only students in it will be allowed access the link. Once the email has been sent, open up the TagSet view again, open the saved TagSet, then press [Return ALL in Grid]. Press [Save the Current Changes] to set the link back to the original students. If the original link was sent to a year level and you have chosen to re-send it to few students using a tagged set, ensure you un-select the tick in “Tag Set” after sending, then press [Save the Current Changes]. This will ensure it is available to the year level, not the members of the Tag Set.